Buti Yoga - Feel fierce, refreshed, and ready to take on the world! Buti Yoga is a group fitness format that blends yoga, plyometrics, and dance and is set to transform you from the inside out. 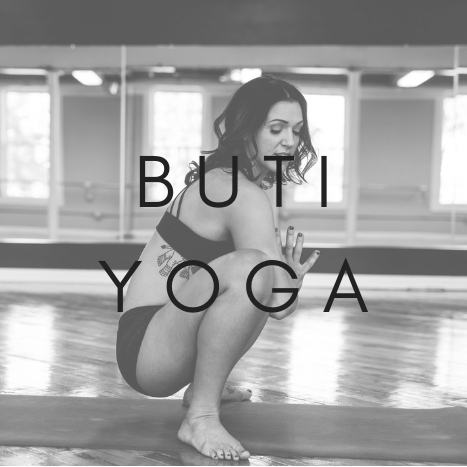 The name Buti is derived from an Indian Maranthi word which means “the cure to something hidden or kept secret.” More than static stretches and poses, Buti classes are fun, high-energy workouts that feel more like dancing, connecting, and releasing than work. Sweat along to the pulsing beat of the music while reconnecting with your body. The movements will challenge your body along all planes of motion, resulting in long, lean muscle and curves. You will leave class feeling the Buti bliss- fierce, refreshed, energized and ready to take on the world! Buti Yoga inspires you to let go and be free inside your body, follow natural movements, and feel liberated. The spiraling motions of Buti free your hips and increase energy flow throughout the body. This high-energy workout will improve your heart health, increase circulation, reduce stress, and lengthen and sculpt your muscles. You will notice a change in your abdominal structure within the first few weeks. Regular practice can also help lower blood pressure, reduce insomnia, increase flexibility and strength, and improve metabolism. By the end of each Buti class you will feel stronger, more empowered and more in touch with your inner self.